We took a day trip today to enjoy the spring-like Presidents Day weather, so this post is a bit late, but I did a lot of reading this week and wanted to post an update. 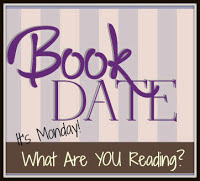 Since last Monday, I read two of James Patterson's Bookshots. The House Husband by James Patterson and Duane Swierczynski was a little bit creepier than what I would normally choose to read, but as the back of the book says, it was "impossible to stop reading." I had to know how everything would turn out. 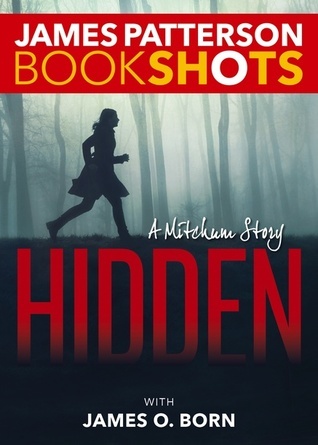 Hidden by James Patterson and James O. Born was much more interesting to me, as it was set near where I grew up. Patterson knows this area well, as he went to high school there (at the same time as my father), but there were some details that seemed a little off to me, probably because he doesn't live there anymore. Though the story took a weird turn about 3/4 of the way through, I liked the main character, Mitchum, well enough to want to read the next title in the series. I also finished reading Murder of a Sweet Old Lady by Denise Swanson, which is the second book in the Scumble River series. This is becoming one of my favorite mystery series. Skye, the main character, is Catholic, and she actually goes to confession in this book, which I enjoyed. I also liked all the nuances of her family relationships, which create a lot of difficulties and drama when her grandmother is found murdered. I'm going to have to use inter-library loan to get the next few titles, as it appears the local libraries have weeded the earlier books of the series, but I'm planning to read the next one whenever I can! Currently, I am reading State of the Onion by Julie Hyzy, which is the first in The White House Chef mystery series. I am finding it very quick and exciting reading, and I'm glad to know the series is still ongoing. I also have Cover Story by Erika Chase checked out of the library in paperback, and Murder Past Due by Miranda James just became available for me on Overdrive. I hope I'll be able to get to both before they are due back. Last week's story was "A Jury of Her Peers" by Susan Glaspell (♦K). Minnie Wright has been accused of killing her husband after Mr. Hale found the man strangled in bed. The next day, Mr. Hale and his wife, and Sheriff Peters and his wife go to the Wright house to get a statement about what exactly Mr. Hale witnessed. While the men self-importantly walk around the house trivializing Mrs. Wright's housework and trying to determine a motive for the murder, Mrs. Hale and Mrs. Peters reflect on how they might have been more friendly to her and ultimately uncover clues which they choose not to share for fear the woman would be convicted. This was a well-written and powerful story..
For this week, I drew an O. Henry story, "A Cosmopolite in a Cafe" (♣K). In a cafe, the narrator meets E. Rushmore Coglan, a seeming cosmopilite who has no loyalty to any particular place or pride in any one nation. Coglan is described this way: "He spoke disrespectfully of the equator, he skipped from continent to continent, he derided the zones, he mopped up the high seas with his napkin. With a wave of his hand he would speak of a certain bazaar in Hyderabad. Whiff! He would have you on skis in Lapland. Zip! Now you rode the breakers with the Kanakas at Kealaikahiki. Presto! He dragged you through an Arkansas post-oak swamp, let you dry for a moment on the alkali plains of his Idaho ranch, then whirled you into the society of Viennese archdukes. Anon he would be telling you of a cold he acquired in a Chicago lake breeze and how old Escamila cured it in Buenos Ayres with a hot infusion of the chuchula weed. You would have addressed a letter to "E. Rushmore Coglan, Esq., the Earth, Solar System, the Universe," and have mailed it, feeling confident that it would be delivered to him." There isn't much of a plot to the story, but there is a Henry-esque twist and the writing is delightful. This was also a productive week for reading children's books. I read Roller Skates by Ruth Sawyer as my 1930s pick for Newbery Through the Decades and I finished both The Fantastic Flying Journey by Gerald Durrell and This Place Has No Atmosphere by Paula Danziger for Old School Kidlit 2017. I was surprised by how different the Durrell and Danziger titles seemed to me as an adult. I didn't love them nearly as much as I did as a kid. I loved Roller Skates, though. My review will be up later in the week. This week, I'm hoping to read Cloud and Wallfish and maybe a couple of other things. I have a chapter to write for my summer reading textbook, and puzzle proofreading to finish by Friday, so it might wind up being a slower week reading-wise. 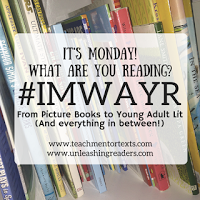 I'm linking up with Teach Mentor Texts and Book Date. I look forward to reading what you think of Cloud and Wallfish. As a big fan of all those cold war spy novels, I found it fascinating to see East Germany from a child's perspective.